If you have forgotten your password, you can click the "Forgot Password" option in the login page, and then the system will automatically redirected to a password reset page. If you need to register a SEPBox account, you can click "Register" option in the login page. If you need to activate a SEPBox account, you can click the "Activate" in the login page. When you completed registration (Step 1) and authentication (Step 2), the activation code will be mailed to the registered address, and then you could go to the SEPBox website to activate your account (Step 3). When activation has completed, go to this page and enter your SEPBox ID and password to login. 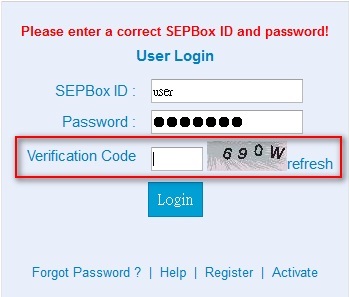 If you incorrectly enter your SEPBox ID and/or password consecutive six times, the system will require you to enter a verification code.